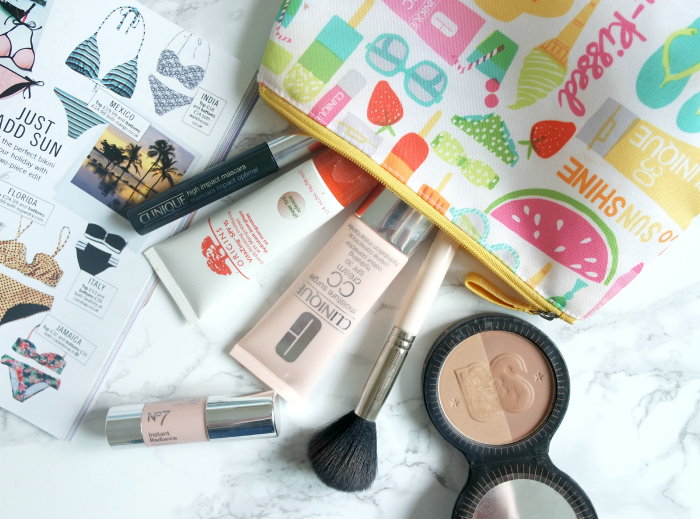 What's In My Holiday Make Up Bag? During the days, all I'll really be using on my face is the Origins Vitazing SPF 15 Tinted Moisturiser. In 30 degree + heat, I can't think of anything worse than having a face full of foundation. But I still like to give my skin a bit of summin' summin' so this tinted moisturiser is a great shout as it's an extremely light base that evens out my skin tone and also has the bonus of an added SPF. I was a bit freaked out the first time I used this as it comes out a grey-ish colour, but that soon turns to a much more skin-friendly tone when you start to rub it into your face. I actually find the shade of this a bit too dark for my natural colour so it's perfect for when I'm away and have a bit of a tan. On evenings, I like to wear a bit more make up as I'll be going out for meals and drinks so it's nice to make a bit of an effort, right? The weather will still be in the mid twenties, though, even after 8pm so I'll be sticking with a light base, again, and opting for the Clinique CC Cream. I actually think this product is quite thick for a CC cream and I'd say it gives a medium coverage, rather than light. However, it still feels a bit lighter, and more moisturising, than a standard foundation. To add a bit of definition and colour to my face, I'll be relying on the Soap and Glory Solar Powder. I use the darker shade for contouring and, the lighter, as a bronzer. S&G did seriously good with this powder as it allows you to achieve a really natural contoured look - unlike some bronzer's which leave me looking like I have a streak of mud on either cheek. To give my face a bit of a glow, I'll be reaching for the No7 Instant Radiance Highlighter. This cream-based highlighting stick has a subtle, shimmery finish that makes you look glowy, but not glittery. The best kind. It's a handy little product to have as it doesn't require a brush and is really easy to just blend in on the go. For my eyes, I'll be using my go-to mascara; Clinique High Impact. I've used this for years and, as I have sensitive eyes, I'm way too scared to try and switch to anything else as I know this doesn't cause any irritation. What I love about this mascara is that it really doesn't budge once it's on - which is ideal when you're in a warm climate as other mascaras, I've found, can often leave black smudges under your eyes which is naaat a good look. And that's pretty much it! I might add a sweep of eyeshadow or a pop of lipstick if I'm feeling a bit sassy some nights and I might find the effort to do my eyebrows but, overall, I'll be keeping my make up pretty simple during my week away. What are your favourite beauty products to wear whilst you're on holiday? Follow me on bloglovin and never miss a post!